Study: Structure IV, mixed media collage, 5" x 5"
Mark Peterson brings formal training in traditional disciplines to his own work as a painter. Originally from West Des Moines, Peterson earned his B.F.A. 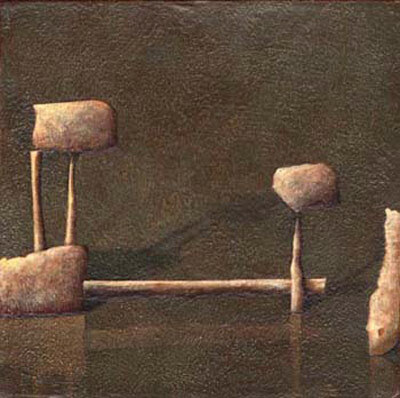 in painting from Drake University in Des Moines under the influence of Jules Kirschenbaum, at the same time he worked as studio assistant to Jack Wilkes. Confirming his skills in drawing and painting through his work with these two exacting masters of realism, Peterson then spent the Summer of 1996 at the Taller Cultural School of Art in Santiago de Cuba. There in workshops and discussions, he interacted with artists from Cuba. Returning to Iowa, he served as instructor of art at the Des Moines Art Center and at Kirkwood Community College in Cedar Rapids, Iowa. Of his paintings, Peterson writes: "Structures in my work are not objects immediately readable, nor do they exist in a place you can visit. My hope is to draw viewers into the paintings with these techniques (of shadow, texture, and reflection) and then free them of responsibility to figure it out. In creating the objects and compositions, I use small pieces of distressed paper torn into random shapes. I then arrange these pieces on a small color field until the composition feels complete, then paint into the objects and background defining new spatial relations. I find this way of working results in more organic and spontaneous images."